Seeing such kindness. It feels me with DETERMINATION! MAJOR SPOILER ALERT FOR THIS COMMENT. I cried even when I got the True Pacifist ending... Because you still couldn't save him completely. He still turns back into Flowey, albeit much reformed, and doesn't leave the underground. One of a very small number of games to really hit my emotions hard. Oh god I just wanna hug him and let him know everything will be okay. What makes me heartbreakingly sad is that, it's not going to be. all that was was just an echo of who he use to be. and pretty soon, he's going to be that evil soulless flower again. But what hits me the hardest is the fact that such a loving, pure spirit, the kindest most caring most loving child in the underground, turned in to the worst monster in all of pop culture. It just kills me. Sue me :p No one playing the game would know where this was from and I didnt mention it. Sue me :p No one playing the game would know where this was from and I didnt mention it. Also thx! Playing that theme while looking at this picture, trying my very best not to cry but kinda sucking at it... fills me with determination. I'm such a sucker for this character. Good work, even if it makes me sad. But seriously though, TAKE MY SOUL ASRIEL. YOU NEED IT MORE THAN I DO. I honestly am upset that there's no way to save him. I kinda want to find Chara's soul and give it to him, since I think he/she would want him to have it. Failing that, I'd go with what I originally thought of when I played it. I'd break my own cleanly in half and hand him one saying "You need this to stay with me, right? Don't worry, I have enough Determination for the both of us!" I'm just wondering....why can't he keep one of the souls he has that no one else needs? Because everyone needs their soul or they will be dead. He originally died remember. You mean one of the human souls. It's implied that they continue on after the person dies, like they go to heaven or something, but it's never explicitly stated. It's possible it's just a loose end. They exist in the best of stories. The player's heart also strangely shatters after losing which is inconsistent but could be another loose end. It's a game. Then again...theorycrafters are all over this stuff so maybe they have better answers. I'd rather see if we could convert Chara's soul (it's implied Alphys used it for the initial determination experiments) into a monster soul (just turn it upside down and paint it grey!) 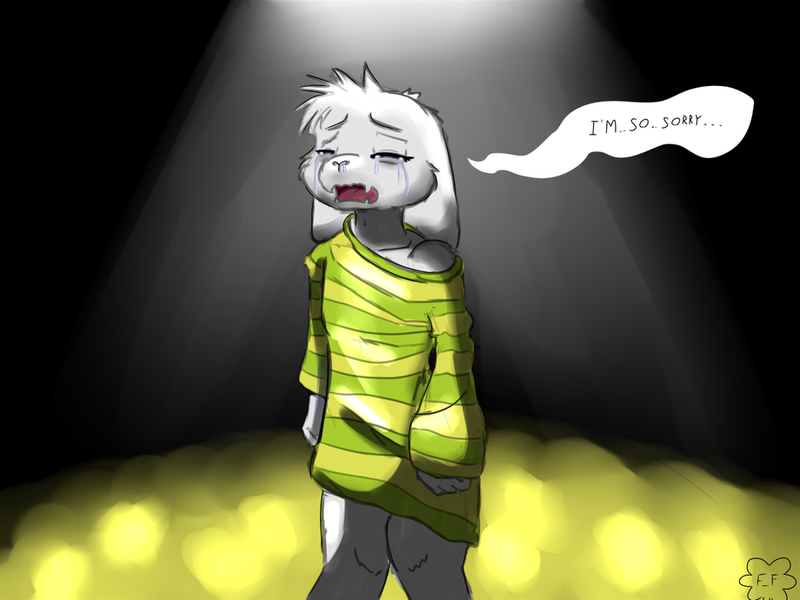 for Asriel. You should check out Overtale. It's a fanmade game project that has gotten the go From Toby Fox. Might as well be canon at this point when the creator says go for it. Yea, that's what I mean. One of the human souls. Though, upon retrospect, I suppose that wouldn't work. He'd just become like his other self.... just not as powerful. He'd need a monster soul to stay normal.